Help Us Change Lives & Perspectives Through Media Arts! 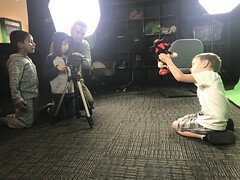 The Digital Gym is owned and operated by the Media Arts Center San Diego, a 501(c)(3) non-profit organization committed to providing filmmaking tools and media education to under-resourced communities in an effort to create social change. Media Arts Center San Diego is kicking-off its’ 2018-2019 26th season with a new membership program! Now you can receive exclusive benefits to all our core programs under one membership program. Whether your son/daughter attends our Youth Media & Tech Camp, you see movies at our Digital Gym CINEMA or the annual San Diego Latino Film Festival, there’s sweet deals for everyone! Plus, more importantly, you’ll be supporting our nonprofit’s mission of providing new media tools and channels to create equitable and engaged communities where underserved voices are heard! 1 Sponsored Seat at the Digital Gym Cinema – A small plaque with your name will be attached to one of our seats! Become a MACSD member today. Join Online.